Next to one of the best, but often forgotten parks in central Copenhagen, lies Ørsted Ølbar. Named after the Ørstedsparken park, Ørsted Ølbar has one of the city’s greatest all-round selections of beer. 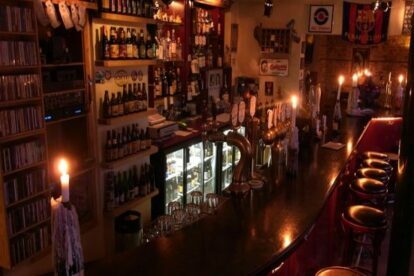 There are many beer bars in Copenhagen. Some specialize in Belgian beers, some in British and some in American and Danish microbrews. But Ørsted Ølbar can do a little of everything. Here you can find everything from Danish microbrews to Italian sour ales and all the classics in between. Sporting around 200 different beers, with a good selection on tap, Ørsted Ølbar is sure to satisfy your every beer need. They even have their own house brew, a Kölsch named Beerdog brewed by local microbrewery Amager Bryghus. Some of the Copenhagen beer bars have a tendency to be quite snooty at times, but at Ørsted there is none of that. You’ll get good guidance from the knowledgeable staff but you’re free to drink whatever you like, either cheap and simple or expensive and exclusive. Attributing to the relaxed atmosphere is the foosball table and TVs showing football/soccer games. And of course a couple of seats outside. So basically you can summarize Ørsted as a great local bar, with good people, great staff, football on TV and a lot of great beer. What’s not to like? Ørsted also have a sister bar “Søernes Ølbar”, right on the lakes at Sortedam Dossering 83.